The Soča Valley region stretches from the Triglav National Park to Nova Gorica and includes the towns of Tolmin, Kobarid and Bovec. Surrounded by the majestic Julian Alps, the Soča Valley wows visitors with its unspoiled nature and the aquamarine Soča River that threads its way through it. It is a safe and enjoyable destination that is a definite ‘must visit’. Despite its remoteness the communal infrastructure in the three major towns is very well arranged and along the Soča Valley and the nearby towns there is a good range of accommodation facilities. Visitors can choose between hotels, apartments, hostels, wooden cabins and camps. Soča valley’s gastronomic scene is also worth a mention, as the locals have known about and enjoyed good food for a very long time. Adjoining the Valley there are many roads and paths leading to spots where the traditional old farm activities are still alive and well today, and where every housewife knows how to prepare the famous local dessert “kobariški štruklji“ (a delicious dessert made from dough stuffed with walnuts, raisins and other tasty ingredients), a dessert to which the culinary grandees of the town even dedicate a festival. Its unspoiled nature makes the Soča Valley a European incentive epicentre that offers a complete infrastructure for adrenaline and active incentive programmes, from agencies to guide services and accompanying services, including all of the necessary equipment for the most unusual requests. The destination has been attracting guests interested in active holidays and adrenaline challenges for many years now, but at the same time caters for those seeking more peaceful pursuits and contact with nature through other sports on the Soča, such as fishing and hiking, as well as exploring the area’s rich history. The River Soča is suitable for recreation, but also for a bit more of a demanding paddle. Rafting on the rapids of the emerald river can help strengthen team spirit, whilst at the same time one can admire the beautiful surroundings of the valley. Since 30 June 2007, the outdoor museums and the most important remains and memorials of the Isonzo Front in the Upper Soča region have been connected into the Walk of Peace. It is dedicated to the memory of the multitude of casualties of the First World War. The visitors centre in Kobarid, which is free of charge, offers a new interactive exhibition of The Walk of Peace. Underworld explorers and adventurers will find many interesting sites with the potential for everything from leisurely tourist excursions to more demanding expeditions. It is reputed that the Renaissance poet Dante Alighieri supposedly found inspiration for the terrifying images of his Inferno in Zadlaška cave. Take a walk to the spring situated in the Sopotnica stream gorge above the village of Gabrje and take a sip of some of the water that, according to local tradition, was carried in wooden containers to the Tolmin Count at his castle on Kozlov rob, because he believed that it would keep him forever young. Well, perhaps that didn’t happen, but according to measurements using radiesthesia it is one of the best waters in the world. 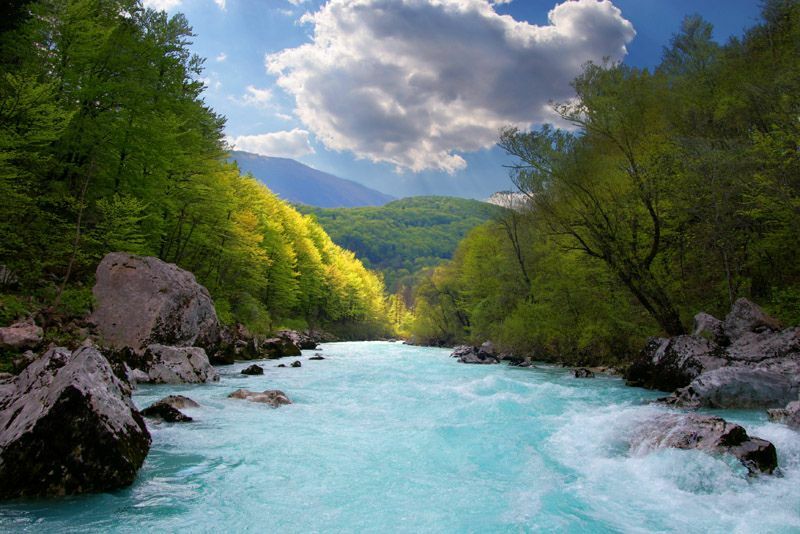 The Soča Valley is situated at the junction of Mediterranean, Dinaric and Alpine worlds. The exceptionally dynamic terrain and numerous mountain and forest roads and cart tracks offer plenty of opportunity for mountain biking. Less demanding visitors can be equally satisfied by biking along the gentler roads that connect the villages in the valley. Soča Valley is the home of many festivals that take place throughout the year; the Soča trout festival, JESTIVAL – Food & Art festival, The Drežnica festival, sport festivals like the Soča Outdoor Festival, Podbrdo Trail Running Festival and Hiking festival, and music festivals such as Metaldays, Punk Rock Holiday, Overjam international Reggae festival and the Creative camp Sajeta.